"It's a sad day when you have members of Congress who are literally criminals go undisciplined by their colleagues. No wonder people look at Washington and know this city is broken." "Edmonds's claims have never been pursued, presumably because there are so many skeletons in both parties' closets. She has been served with a state-secrets gag order to make sure that what she knows is never revealed, a restriction that the new regime in Washington has not lifted." "In Hastert's case, it certainly should be a matter of public concern that a senior elected representative who may have received money from a foreign country is now officially lobbying on its behalf. How many other congressmen might have similar relationships with foreign countries and lobbying groups, providing them with golden parachutes for their retirement?" Congress went mum on my case after theVanity Fair story, with, of course, the mainstream media making it very easy for them. They turned bipartisan in not pursuing the case, with the same zeal as they have, so far, not pursued the Harman case. Similarly, the mainstream media is happily letting it all disappear. I was not aware that during the publication of the Hastert story in Vanity Fair, Jane Harman's AIPAC case was already brewing in the background. Moreover, one of the very few people in Congress who was notified about Harman was none other than Hastert -- the man himself. 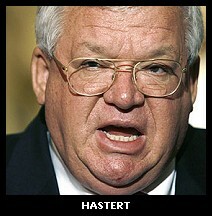 The same Hastert, who in addition to being one of several high-ranking officials targeted by FBI counterintelligence and counterespionage investigations, was also known to be directly involved in several other high profile scandals: from his intimate involvement in the Abramoff scandal, to the Rep. William Jefferson scandal; from his 'Land Deal' scandal, where he cashed in millions off his position while "serving," to the 2006 House Page scandal.